These 18in Doll Figure Skating Dresses are just adorable! 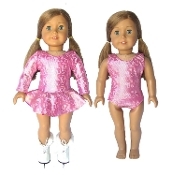 Fits American Girl Doll® Each dress is handmade in the USA from quality lycra or glitter velvet. Great Birthday or Christmas present! Very limited quantities. Christmas This Year Holiday Costume. Pinafore dress made of polka dot poly/ spandex trimmed in contrast shiny spandex and ric rac. A bow is attached at the waist and the skirt features a decorative pocket. Includes polka dot hair bow. Available in Child XS - XL. Gingerbread Man Holiday Costume. A gingerbread-inspired dress made of stretch twill with a matte nylon/spandex inset at the center front and back, trimmed with ric rac and adorned with decorative buttons and satin bows. Includes gingerbread hair bow. Available in Child XS - XL. Jerry's 156 Pink with a Wink Ice Skating Dress. A rich, deep fuchsia pink velvet dress with long glitter velvet sleeves and bodice. Locket style back keyhole accented by a matching crystal buckle and a double layer georgette skirt. Available in in Child Size 4 - 14. Jerry's 208 Hibiscus Whirl Ice Skating Dress. Petal pink shimmer mesh adds subtle shine and glamour to this clear pink confection. Available in in Child Size 6 - 14. Jingle Bell Rock Holiday Costume. This holiday dress features a hologram sequin spandex bodice accented with three large, decorative buttons and a sequin bowtie. Attached briefs. Glitter free! Made in USA. Includes Mini top hat headband. Available in Red or White in Child XS - XL. Sequin Christmas Holiday Costume. This “Pennies from Heaven”-inspired Ultra Sparkle dress features a powermesh neckline with an attached metallic cummerbund and Ultra Sparkle and glitter tulle skirt. Includes sequin pillbox hat. Available in Red or Green in Child XS - Adult L. Jerry's 149 Jewelled Lace Ice Skating Dress. Vibrant velvet dresses with long lace sleeves, lace trim around the scoop neck, triple back straps, a matching georgette skirt and a scattering of crystals front and back. Available in Purple, Fuchsia and Sky Blue in Child Size 6 - 14. Jerry's 189 Diamonds on Asters Skating Dress. Like dew drops on deep purple asters, the sprays of sparkling crystal rhinestones add bling to the asymmetrical styling and petal point skirt of this textured, two-toned amethyst dress. Lined. Available in in Child Size 6 - Adult Small. Jerry's 206 Sea of Sapphires Figure Skating Dress. Stunning royal blue sequins sparkle and shine from every angle of this upbeat style. Splashes of turquoise in the underskirt and along the shaped bodice interject a tasteful dual toned elegance. Lined. Available in in Child Size 8 - Adult Small. Jerry's 30 Snow Swept Figure Skating Dress - Clearance! Intricate silver glitter velvet is cut in a flattering curved shape at the front and back. Lined. Available in Child's size 4 - 12. Clearance! ChloeNoel DLF38 Fleece Skating Dress w/ Crystals. You're sure to stay warm in this long sleeve fleece dress. Traditional skirt with crystals. Available in several colors in sizes Child XXS - Adult XS. Clearance! Jerry's 166 Lunar Lace Skating Dress Jerry's 11 Ice Shimmer Figure Skating Dress - CLEARANCE! Clearance! Jerry's 166 Lunar Lace Skating Dress has silvery white lace over an opalescent purple glitter. Pretty sweetheart design, scoop neck and long lacy sleeves. Available Child's size 6 - Adult Small. Jerry's 11 Ice Shimmer Figure Skating Dress - CLEARANCE! Soft, shimmering velvet dress with crossed & tapered back straps, crystal accents at the shoulders and double layer skirts edged in silver. Available in Black in Child Size 6 - 14. Jerry's 12 Rhinestone Figure Skating Dress - Clearance! Velvet dress with long mesh sleeves, a square neckline, georgette skirt and a scattering of rhinestone crystals front and back. Available in Black, Blue, Purple or Red in Child Size 6 - Adult Small. Not quite sure what to buy for your special skater? Try a gift certificate! Gift certificates can be used to purchase any item.